Because apparently I don't blog when I think about it, so then I have to cram everything into random dots. *Advent = awesome. At church we got the new hymnal just before Advent, which gave us SEVEN verses of O Come O Come Emmanuel to sing. Love it. Add that to the Advent Wreath and its ever-evolving decorations to match the Elemental theme (fire, air, water, earth) and we have a recipe for fabulous. *I confess that I didn't manage to keep up with every day of the ReThink Church advent photo-a-day project, but I did many, and I've loved getting emails and FB posts with other people's. We put them on a bulletin board outside the sanctuary. So great. *Book group this month was children's Christmas books shared over the best hot chocolate ever. Love the Book Group. *Christmas also = awesome, and it hasn't even technically started yet. 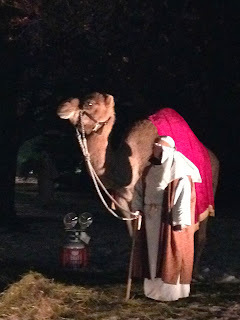 The Live Nativity was super fun, complete with Kelijah the camel. *My dad (yes, I know you're reading this, dad) only managed to open one of his presents early and without warning (dad! who opens boxes they didn't order during December?? ), and to spot one of them and know what it was before my brother could intercept and wrap. *A dear friend sent me a new board game that I can't wait to play…someone come over and play Forbidden Desert with me, seriously. *I ate about a pound of fudge while making bulletins for January. *And soon…very soon, in fact, TONIGHT, I'll be on a plane to a place where the temperature is more than 80 degrees warmer than it is here. Because here it is below zero, and there it is 79 degrees. See you in 14 hours, southern california! I think my favorite part of the Live Nativity on Friday night was watching children as they realized that Kelijah the Camel was real and alive, not just a prop. It’s not every day that we get to be up close and personal with such a large exotic animal, and Kelijah played his part very well. He was gorgeous and friendly, posed for pictures and endured our squeals, whispers, giggles, and awe. And most of all, he was real. There’s lots in our world that isn’t real. We’re used to photoshopped people and food grown in a lab. We’re used to being marketed to and we’ve learned to see through many of the messages and images that bombard us every day. Even reality TV isn’t real, and we know it. So to see something so amazing as a real live camel, in the flesh, and not just behind a fence at the zoo, is an incredible opportunity. It’s a reminder to us all that there’s something about in-the-flesh reality that still matters, even in our technological age. Not just a god far away, pulling strings and pushing buttons, sending hardship to some while smoothing the path for others, this god is the real deal. God is not content to stay in heaven, looking down and laughing or crying at the things we do. God does not want to be just another photoshopped advertisement or domesticated idea—God comes to earth, in the flesh, and is real. Walking, talking, moving, eating, drinking, laughing, crying, real. John says “and we have seen his glory”—which I interpret as oohing and aahing, squealing and gasping like children seeing just how big a camel really is, up close and personal. No one has ever seen God…except that we have, because the Word made flesh is God, visible and available and living right here, on earth, with us. Living a human life, struggling human struggles, walking the same ground and breathing the same air and drinking the same water. Imagine how much God must care for the earth and all its people, to take up residence right here, in a frail human body in the midst of a fragile ecosystem. I mean, God could always just make a new planet and call a new people. God has the creative power to start over. God has the destructive power to start over, too. Yet God has promised not to destroy again, but rather to make a new heaven and a new earth in the most incredible way: by walking around on the old one and teaching and healing and reconciling until it’s like new. That’s an incredible commitment to physicality, there—a commitment to the human body as a temple of the Holy Spirit, a commitment to life, a commitment to the creation in all its glory and messiness and confusion and wonder. God is invested in the world—for God so loved the world that he came to walk on it and live in it and save it—the whole shebang. In the beginning was the Word, and all things came into being through him, and the Word was life and light of all people. Last week at the potluck I asked what that word might have been, and the first answer was Love. By speaking Love, God brought the world into being, and Love was the life and light of all people. Since we know from elsewhere in scripture that God Is Love, this seems like a good word to be the root of all things. How might we be changed if the word at the center of this busy season was Love? 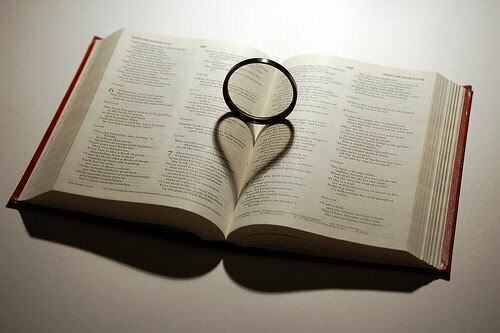 How might the world be different if the word behind everything we said was Love? What would our lives look like if the root of every action, at the mall, at work, at home, at school, at church, and everywhere in between, was Love? What if God is preparing the world by insisting on love, by speaking love—even to us, and even to them? What if God is preparing us by shining the kind of light that only love can bring? Last night was the longest night of the year—are we willing to step into the light? Or will we continue to believe that love is just a nice feeling and some things and some people aren’t worthy of it? Because here’s the thing: this Word become flesh, this Love made visible and tangible, is not about a feeling. It’s not all warm-fuzzies-baby-in-a-manger. That baby grows up and will say things we don’t really want to hear. The Christ child grows up to turn everything upside down, and that turning is what will reveal God right here in our midst. This overture gives us a hint, but when we dig into John’s gospel in the coming months we will find that God-with-us will shine light in places we’d rather keep dark, and will speak truth we find uncomfortable, and will behave in ways that are contrary to everything we thought we knew. The Word won’t stay in the manger. The Word became a human being, and will refuse to be a prop in our play—this is God the real thing. This love will demand things of us, because God refuses to be just words on a page, just ideas in a sermon, just in our heads. Word made flesh means that the Word also takes up residence in our flesh—no more can we simply believe things about God, because will not be trapped in thoughts. God is in a body, and in our bodies, and this fleshy word changes everything. And let’s not forget that we are created in the image of God, so we also have the power to speak and create. Our words can bring light and life, or they can bring darkness and pain. We can testify to Love, or we can remain silent and complicit in a world of dark indifference. The Spirit can speak through our voices, or we can insist on sticking to our own script. We have the power to become children of God—to use our words to shine God’s light, to allow the fullness of grace to overflow through us. With that power of speech comes great responsibility—to use that power for good, to ensure that every word and every action is Love. Not everyone will choose that way, for some prefer the darkness, but this is how we know a disciple of Jesus: Love. This is how God is made known—through the Word, speaking all things into being, making God visible, Love taking on flesh and living with us. And we are the body of Christ. Yesterday at church we got a call from a young man who was looking for a place he could do 10 hours of community service. Before Thursday. And already at this point in the story, everyone to whom I've told it has made some assumptions about this young man. When I add in his name, which (let's just say) is not a "typical American name" (even though it is), the assumptions solidify. If I told you his skin color, we wouldn't even need to say anything more beyond "required community service" and we'd have a complete picture in our minds. 1. When did community service become a punishment? And why? I have so many issues with that. Probably its own blog post. 2. Why is our first assumption--often our only assumption--that this young man must have gotten into trouble? I remember being about his age and filling out my National Honor Society paperwork. At the last minute. And looking at the requirement for community service hours and wondering how to pull that off. I remember being in seminary and filling out paperwork about myself and wondering if something I technically got paid for, but badly, could still count as "service to the wider church." A couple of years ago the youth group was doing an Earth Day service project cleaning up trash in a local park, and nearly every conversation we had with community members using the park was about kids "serving their time," not about kids giving back or kids being good citizens or kids caring about their community. Afterward the youth and I talked about that feeling of being stared at like they're criminals, and the assumption that the only reason they would go clean up a city park is because they were paying off some kind of debt to society. It's possible that this young man needs community service hours for a scholarship, for a Boy Scout requirement, for a club at school, or for his own church. Or it's possible that he's been in trouble--whether of his own volition or by being in the wrong place at the wrong time. A few years ago I was at a David LaMotte event where he said something about "at risk youth" and how that becomes a self-fulfilling prophecy, because at-risk always means something bad. No one is ever at risk of being awesome. What if we--ESPECIALLY those of us in the church, who have been admonished to think about whatever is good, to look for the image of God in one another, to bear one another's burdens--what if we first assumed people were at risk of being awesome? I have to confess to you that I’m not much of a zombie fan. The craze of zombie apocalypse preparation, which has even reached the CDC, has me rolling my eyes. I mean, honestly, the science behind the whole zombie thing is a little ridiculous—just ask Neil deGrasse Tyson. I’m much more of a vampire girl. But I will admit that zombies and vampires share some similarities, at least in the classic forms (Twilight is a whole other thing completely outside the usual lore, so we’ll leave them out of it). Most obviously, of course: they’re both dead, or rather undead. They walk, talk, and have survival instincts, and in many ways act much like normal people, with feelings, thoughts, and even relationships. That’s how we know that God didn’t take Ezekiel down and dump him in the middle of a zombie army: because the vision begins and ends with breath. Ezekiel wrote to people in exile—people who had been taken from everything they knew, whose homes and Temple and lives had been destroyed, people who were certain that they were alone, abandoned, hopeless. These are the people who gave us the lament “how can we sing the Lord’s song in a foreign land?” The light had gone out from their eyes, the songs had fled from their lips, and they may as well have been dried up and dead. Ezekiel’s vision begins in a mass grave, the bones jumbled together and dried out, no possibility left. Sometimes life feels like that. Hopefully not all the time, but at some point in most of our lives, the darkness seems impenetrable. Possibilities dry up. Grief clouds our vision. We long for the way things used to be. We miss family and friends who are no longer with us. We can’t understand what is happening in the world, in our nation, in our church. Nothing is turning out like we imagined. We look back at the good old days, not just to reminisce but also to grieve for our dreams, which may not have come true. This happens in our individual lives, and our communal life. Sometimes it can feel like the church is in exile—somewhere along the way, we stepped off the path, or the path moved and we didn’t notice, and now we can’t see how to get back. We are tired, burning out, and wonder when it’s our turn to rest and someone else’s turn to do all the things church is supposed to do. All we can see is what was, and in comparison what is or what might be are just not worth singing about. Into that dark nostalgia, the Spirit of God blows like wind. Last week I said that Advent may be the season when God is preparing us, rather than only a season when we are preparing for God. This vision of Ezekiel’s is exactly that: a story of God preparing the people. It takes several steps, though—like any good thing, it’s worth waiting for, but the waiting can be the hardest part. The first step is that God pulls this jumbled mess of bones together, bone to its bone, in the right order so they can be whole. But just a complete skeleton is still not a body. Sure, we might have all the right pieces, but that doesn’t make us ready. The second step is God putting flesh and sinews—holding together the bones with tendons and ligaments, muscles and fat, organs and tissues. Bones by themselves aren’t much use, really. They only stick together if they’re immobilized, like in a museum. This second step makes movement possible, so we’re not a museum piece, but still not a whole body either—though it’s starting to look familiar! The third step is God covering the bodies with skin. The largest organ in the body, skin not only holds everything in, but protects too. We may want to get moving, but without skin the body is susceptible to injury, infection, and falling apart. This step in the preparation may be uncomfortable, because we don’t like boundaries. But without them, viruses multiply and pieces fall out. At this point, stuck together with all the right pieces, we’re chomping at the bit, ready to go! This is the moment most of us as both individuals and churches get to, and then we’re off. We look like the body, feel like the body, and feel perfectly put together and prepared. Three steps is just right for our attention span and for our capacity for waiting for God to get to work already. So we walk around, doing things, trying our best, and still can’t figure out why people aren’t flocking to churches or why there’s a budget deficit or where the families are going. We listened when God called us together, so how come things still aren’t the way they used to be, when pews and classrooms and offering plates overflowed? God promised to restore us, so why aren’t we reliving the good old days yet? Because at just three steps, that valley is full of zombies. And zombies are, by definition, living in the past. At this point in the process, we’re not jumbled up skeletons, but not full of life either. That’s still exile. Yes, we go about our daily lives, we do what we’ve always done, we get by…but there’s nothing transformative happening. It’s just day in and day out. We don’t experience life, we’re not touched or changed, we just…are. Just exist. The Israelites in exile seem to have swung between these two positions—dried up and hopeless, and just waiting out life without expectation. But as scripture tells us over and over, God is a God of the living, not the dead, and not the undead. God’s promise is not just that we’ll walk through life, but that we’ll breathe life. God’s promise is not just that the bones will organize into skeletons and be covered with flesh and skin, but that they will be filled with breath, coming from the four winds, blowing into their bodies and hearts and minds and souls so that they can love God and love their neighbor with everything they’ve got. God’s promise is not that we’ll be undead, God’s promise is Everlasting Life Abundant, even when we can’t see how it’s possible. And we know God keeps promises. Every time. Even impossible ones. The Hebrew word for breath is ruach, the same word that’s translated as wind and as spirit. When the wind blows, that’s the breath of God. When we breathe, that’s the Spirit of God filling our bodies. The very air we breathe, in other words, is God’s presence, God’s promise, God’s hope, entering our lungs and our blood stream. When God tells Ezekiel to call the breath from the four winds, that’s the Spirit that comes rushing in, bringing life and hope and possibility and love. In this season of Advent, we need to take the time to wait for the fourth step, to wait for God to do the most amazing thing, to prepare us not just by putting us together as the Body of Christ, but to breathe life into that body, to transform us from a walking corpse into a living, breathing, transforming, glorious body. The church is not meant to be zombies, but too often we human beings want to take things into our own hands rather than waiting for what the Spirit is doing in the church, or in the world, or in our own lives. Or worse, we don’t want to be transformed, because we like the way things are just fine, and change is hard, and we can’t imagine how it’ll work, and what if it’s not good for me? Here’s what I know: God’s vision is always better than mine. God’s dream is always more glorious than mine. God’s work is always more meaningful than what I imagine on my own. And to breathe the Spirit is always going to be better than the anxiety and fear and frustration of not breathing at all. I dislike waiting as much as the next person. I hate not being in control. I don’t like the feelings brought on by change any more than you do. Letting God prepare me can be painful even as I see it’s for the best. And I also see in scripture and in history and even right here among us that God is way better at this than I am. And if my options are to go through the motions like a zombie or to feel the stretch and burn of God’s breath in my lungs, I’ll take the breath of life anytime. The first sentence God gives to Ezekiel is “I will cause breath to enter you” and the last is “I will put my Spirit within you.” This is the good news, grace upon grace: from the four winds come the four steps of Advent preparation, if only we will wait, and listen, and open ourselves to the winds of the Spirit. No longer a jumble of bones, no longer zombies, but life in all its fullness, transforming into the Body of Christ so that the world can be transformed into the kingdom of God. May the wind blow. Amen. King Nebuchadnezzar made a golden statue whose height was sixty cubits and whose width was six cubits; he set it up on the plain of Dura in the province of Babylon. Then King Nebuchadnezzar was astonished and rose up quickly. He said to his counselors, ‘Was it not three men that we threw bound into the fire?’ They answered the king, ‘True, O king.’ He replied, ‘But I see four men unbound, walking in the middle of the fire, and they are not hurt; and the fourth has the appearance of a god.’ Nebuchadnezzar then approached the door of the furnace of blazing fire and said, ‘Shadrach, Meshach, and Abednego, servants of the Most High God, come out! Come here!’ So Shadrach, Meshach, and Abednego came out from the fire. And the satraps, the prefects, the governors, and the king’s counselors gathered together and saw that the fire had not had any power over the bodies of those men; the hair of their heads was not singed, their tunics were not harmed, and not even the smell of fire came from them. Nebuchadnezzar said, ‘Blessed be the God of Shadrach, Meshach, and Abednego, who has sent his angel and delivered his servants who trusted in him. They disobeyed the king’s command and yielded up their bodies rather than serve and worship any god except their own God. Therefore I make a decree: Any people, nation, or language that utters blasphemy against the God of Shadrach, Meshach, and Abednego shall be torn limb from limb, and their houses laid in ruins; for there is no other god who is able to deliver in this way.’ Then the king promoted Shadrach, Meshach, and Abednego in the province of Babylon. Here we are—the first day of Advent. Today we enter the season of waiting and preparation, the season of trying to hold together both the cultural trappings of the Christmas season and the spiritual importance of waiting in the darkness. It’s not easy, living in this tension. One minute, we’re giving thanks for all the blessings God has given us, the next minute, we’re jockeying in the crowd, trying not to get run over by a reindeer as we search for the best deal. One day we’re singing in a minor key, longing for God’s light to break into the world again, and the next we’re humming Jingle Bells and eating Christmas cookies. But regardless of how difficult it can be, this season matters. Learning to live with both the Christmas cheer and the Advent stillness is important. Looking for the spark of God’s light in the darkness takes practice, and will serve us well when cheerfulness runs out and we’re left wondering what to do next. Very few people enjoy waiting, though. It feels simultaneously like a waste of time and like hard work. And yet there’s a whole season of the church year dedicated to the practice of waiting on God, getting ready for God’s next surprise, sitting with the stillness until we hear the whisper in the silence. This year I encourage you to be intentional about your looking—keep an eye out for what God might be doing during your regular day. One way to do that is with a practice like the photo-a-day prompt: each day there’s a word, and you take a picture that illustrates that word for you. Think of it as an opportunity to look at the world through a different lens, and maybe see the Spirit moving in unexpected ways. This is the season of the unexpected. Keep alert, and who knows what you might see. Nebuchadnezzar saw God and was so surprised he sprang out of his chair in a most un-kingly way. He was a powerful man, used to getting his way. He had destroyed the Temple in Jerusalem and scattered the Israelites into exile. He sat in Babylon, building an extravagant city on the backs of slaves and paying for it with equally extravagant taxation. He led a fearsome army, expanding his empire by conquering land and dividing populations until they were so intermingled with each other that they couldn’t possibly rise up and fight back. Nebuchadnezzar made the rules, and everyone always fell in line. It’s hard to not get what we want. For Nebuchadnezzar, it was unthinkable. He’d been born to the throne, spent his whole life with people obeying him, and if necessary he simply took what he wanted by force. The effect on other people didn’t matter to him—he kept his eyes on the prize and never looked at the people he trampled along the way. This sounds like a familiar story. Perhaps we don’t do this as individuals, but it’s a common theme among nations and corporations, and we do participate in those systems that claw their way to the top with no regard for the welfare of the people involved. Even our language is designed to make them invisible—we say “the poor” “the needy” “the homeless” and “the disabled,” we talk about “diabetics” and “the mentally ill,” and we forget that these are people, with names and stories and hopes and dreams and families, not a condition. We forget that it’s a person who is poor, a person who has diabetes, a person who lives with a disability, and their worth is not defined by their circumstance. It’s a short mental hop from talking about people in this way to actually seeing a condition or a category rather than seeing a person. So often brown skin makes us defensive and wheelchairs evoke pity and a straggly beard or dirty fingernails arouse our suspicion. Meanwhile we’re hunting for the bargain even when we know that the people who make our products or grow our food do so under horrifying conditions and for very little pay. We know that the water and air are being polluted and people are being exploited, and we want what we want and won’t be swayed. Sometimes it seems as if Nebuchadnezzar lives on in the systems we humans have put in place to ensure that those in power can always get what they want, no matter the cost to others. We confess our complicity in these systems, the ways we benefit from injustice, and we wait for the coming kingdom of God that will make all things new. And in this season of preparation, this seems like a perfect story to read. Because usually we like to think of Advent as the time when we prepare. 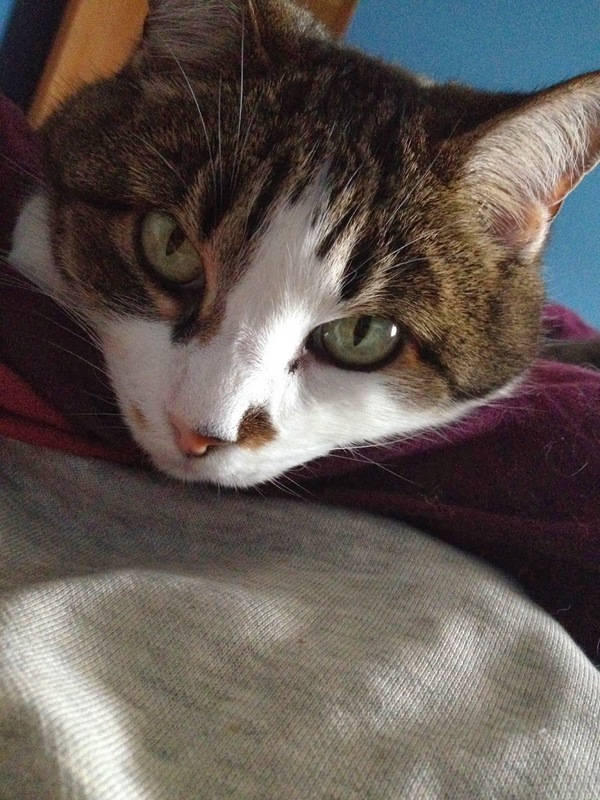 We scurry around trying to get ready. We do our best to declutter our souls as we declutter our houses, and we prepare our inner houses to receive the Christ child by decorating and baking just the same way we prepare our houses for a party. But what if Advent is the time when God prepares? What if God is the one doing the work, getting us ready? We know that in the relationship between God and the world, God is always the initiator. Why would Advent be different? The world needs some preparation, sure—but to think we can do that under our own steam makes us more Nebuchadnezzar-like than ever, insisting that we can do it, we can get what we want, we can force things to go our way. What we find here is that God did something amazing—God showed up, walked through the fire, and changed Nebuchadnezzar’s heart, mind, policies, and personal behavior. And with that preparation, a little bit more light shone through the darkness. We usually read this story in a way that casts us as Shadrach, Meshach, and Abednego. We’re supposed to stand up for what is right, even at great cost. We’re supposed to trust God to deliver us from every trial, to walk with us through the fire and the flood, to protect us and constantly be by our side. And that is an important message—one we need to hear over and over again, that God can be trusted, that God shows up, that we can act on God’s promise, that we too can walk out of the fire without even the smell of smoke clinging to our clothes. But honestly I think most of the time we’re Nebuchadnezzar. We want what we want, when we want it, and we’ll do just about anything to get it. And just like Nebuchadnezzar, when God shows up, we too can find ourselves changed, turned 180 degrees around to a new way of being in the world. This story points to things we’d rather not see about ourselves, which is the first preparatory step in any transformation—to see clearly what is. Like any self examination, it burns like fire. But this fire is not destructive, it’s creative and refining, preparing the soil to receive the seeds, and what walks out of the fire is life that grows into the kingdom of God.